A little aperitif before dinner with friends. 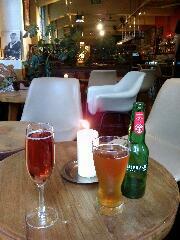 A kir royal for me, an organic fresh beer for you. Under the watchful eyes of Picasso on the upper left.